Updated with menu and price list! 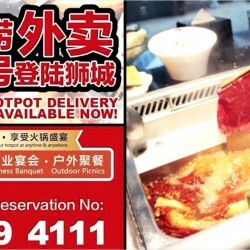 HaiDiLao Hotpot: Delivery Service Available Now! For those who love hotpot, you will be delighted to know that HaiDiLao Hotpot is offering delivery service from 1st November 2015! Enjoy the feast of their Sichuan hotpot anytime and anywhere for a family party, business banquet or even outdoor picnics. Call their reservation hotline 6509 4111 for more information now!